​In a world where children are "growing up digital," it's important to help them learn healthy concepts of digital use and citizenship. Parents play an important role in teaching these skills. 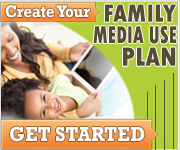 Make your own family media use plan. Media should work for you and within your family values and parenting style. When used thoughtfully and appropriately, media can enhance daily life. But when used inappropriately or without thought, media can displace many important activities such as face-to-face interaction, family-time, outdoor-play, exercise, unplugged downtime and sleep. Make your plan at HealthyChildren.org/MediaUsePlan. Screen time shouldn't always be alone time. Co-view, co-play and co-engage with your children when they are using screens—​it encourages social interactions, bonding, and learning. Play a video game with your kids. It's a good way to demonstrate good sportsmanship and gaming etiquette. Watch a show with them; you will have the opportunity to introduce and share your own life experiences and perspectives—and guidance. Don't just monitor them online—interact with them, so you can understand what they are doing and be a part of it. Know the value of face-to-face communication. Very young children learn best through two-way communication. Engaging in back-and-forth "talk time" is critical for language development. Conversations can be face-to-face or, if necessary, by video chat with a traveling parent or far-away grandparent. Research has shown that it's that "back-and-forth conversation" that improves language skills—much more so than "passive" listening or one-way interaction with a screen. Editor's Note: The tips above were written from two AAP policies, "Media Use in School-Aged Children and Adolescents" and "Media and Young Minds," and the technical report entitled "Children and Adolescents and Digital Media," which were published in the November 2016 edition of Pediatrics. They were also drawn from the proceedings of the AAP Sponsored Growing Up Digital: Media Research Symposium, a gathering of media experts, researchers and pediatricians held in 2015 to address new developments in research and media and their impact on children.